Governor Andrew Cuomo emerged triumphant and emboldened from the State Democratic Party’s nominating convention on Long Island, with the party’s designation in hand and embraced by top national Democrats and elected party representatives from across the state. 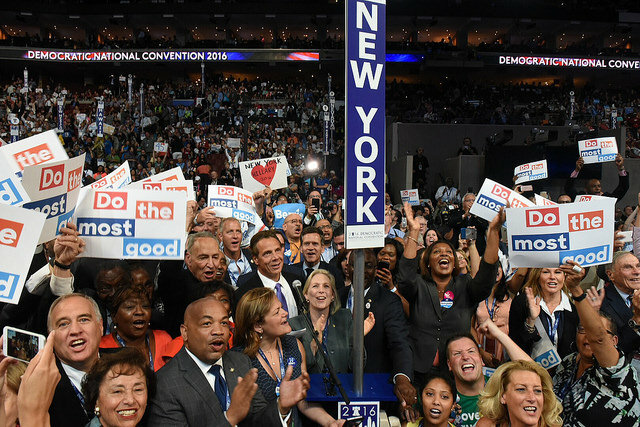 The governor basked in the support of centrist establishment figures like Secretary of State Hillary Clinton and former Vice President Joe Biden, while they and much of the rest of the convention sought to frame Cuomo as a progressive standard bearer who represents the values of a Democratic Party that continues to move leftward. Cuomo and others framed the two-term incumbent as a progressive who gets things done, a trailblazer who doesn’t just talk, but has real accomplishments and is actually a unifying figure for the party -- though he is again being challenged from his left in this year’s primary as discontent from the progressive wing has reached a fever pitch. That fever was not particularly evident at the state party convention, however. Cuomo’s coronation comes at a time when progressives are incensed with his centrism and triangulation with Republicans, and are pushing to elect a “true blue” Democrat to the governorship, personified in this case by Cynthia Nixon. But Cuomo’s supporters have warned of the dangers of liberal absolutism, as Democrats seek to retain what control they have over state and federal branches of government while also unseating Republicans in an age of Trumpism. The stakes are high for both parties, and some question whether Democratic infighting does any good while Republicans control the presidency, both houses of Congress, and many state legislatures (New York’s is split, with one house controlled by each party). The Democratic State Committee had already concluded its nominations on Wednesday, leaving party members free to glad-hand and pat each other on the back as they sang the praises of Cuomo and other top party officials. Cuomo won the party designation with 95 percent of the state committee vote, a resounding victory over upstart challenger Nixon, who did appear at the convention as her campaign launched a blistering effort to paint Cuomo as in bed with Republicans. She continued to criticize him as a fake Democrat whose governing style smacks of expediency rather than sincerity. 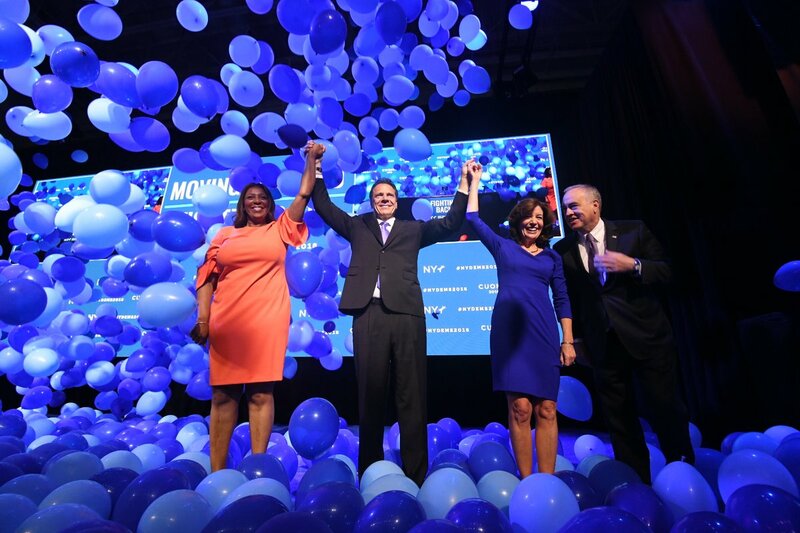 The party also designated as its official nominees incumbents Lieutenant Governor Kathy Hochul and Comptroller Thomas DiNapoli for another term each, and selected New York City Public Advocate Letitia James as the designated candidate for attorney general to replace Eric Schneiderman, who recently resigned after facing allegations of physical abuse by four women. Hochul is facing a primary challenge from New York City Council Member Jumaane Williams, while James is facing Fordham Law professor Zephyr Teachout and Leecia Eve, a former Cuomo and Clinton aide, in the primary. Given how the state committee voted, Nixon, Williams, Teachout, and Eve will all have to collect petition signatures to get on the primary ballot. Nixon and Williams have the backing of the liberal Working Families Party, but may eschew its ballot line for the general election if they are unsuccessful in the Democratic primary. The WFP has said it wants to give its attorney general ballot line to either James or Teachout, depending on who wins the Democratic primary. Though there was much party business and some controversy, the convention went mostly smoothly for Cuomo, who was the unequivocal star. While Cuomo has indeed governed from the center, he was held up as a paragon of pragmatic progressivism at the convention, in line with the image he has sought to craft for himself in recent months, if not years. Before he spoke to the convention, Cuomo was lauded on Wednesday by Clinton and on Thursday by Democratic National Committee Chair Tom Perez and by Biden, who has a long-standing friendship with Cuomo, as a leader who has ushered in transformative change and created a model of governance that Democrats across the nation should envy, and emulate. Marriage equality? Cuomo made it happen in New York and helped launch the nation on the path to full realization. Gun control? Cuomo moved quickly after the Sandy Hook elementary school massacre to ban the military-type assault weapons that have been used in many school and other mass shootings since. College tuition? Cuomo made it free for many middle-class students. A $15 minimum wage? Cuomo put a program in place. Paid family leave? Again, Cuomo. In a lofty and lengthy address, filled with anecdotal life lessons, Biden waxed eloquent about the values of the Democratic Party, of American cultural exceptionalism, of the middle class American dream, as he inveighed against the Republican Party’s “phony populism” and “fake nationalism” that threaten to undermine them all. He spoke of his deeply personal ties to the Cuomo family, and of his and the governor’s shared interest in muscle cars (both of them own vintage Corvettes, he noted). He proudly touted Cuomo’s record. “Andrew Cuomo has never backed away from his progressive principles, not one single time,” he said to applause. To an audience filled with many union workers, Perez hailed Cuomo’s support of labor unions and the state’s immense success in creating jobs under his tenure. And he drew a contrast between the governor and “this other New Yorker in Washington that’s giving a bad name to New York values,” though he stopped short of saying the name Trump. State Assembly Speaker Carl Heastie, of the Bronx, commended the governor for managing to pass ambitious policies despite Republican control of the state Senate. “When you have a quarterback that’s a winning quarterback on a winning team, there’s no reason to change,” he said in his endorsement of the governor. And Senator Andrea Stewart-Cousins, the Democratic minority leader, credited him with reuniting the fractured Senate Democratic conference, setting her up to eventually become the state’s first woman and woman of color to lead a legislative house if the party wins additional Senate seats in the elections this fall. “We can do this and we will make history by finally putting a woman in the room,” she declared. All those Democrats, and the governor himself, put Cuomo on a large pedestal, as a leader who could forge a new path for the Democratic Party and whose administration was an exemplar for other states. The State Democratic Party, as is the case with its national counterpart, is counting on a blue wave that has been building across the nation since Trump’s election. Cuomo has trained his attention, and the state party’s resources, at flipping the state Senate and replacing Congressional Republicans with Democrats. Although he claimed he never appreciated his father’s self-proclaimed title of “pragmatic progressive,” Andrew Cuomo made no effort to distance himself from its definition: “We deliver practical progress for people in need,” he said. Cuomo's criticism of the Democratic Party and assertion that it had lost the election to Trump struck some as awkward, even insulting, given that Clinton -- the party's 2016 presidential nominee -- had praised and endorsed him the day before. The convention also marked how far Cuomo has shifted in the last two years under the Trump presidency and, significantly, in the last few weeks under a deluge of criticism from a left-leaning progressive wing galvanized by Nixon’s candidacy. Cuomo did little to tamp down the rumors that he is considering a presidential run ahead of the 2020 election, something that his opponents from the left and the right have criticized him for. Marc Molinaro, the gubernatorial candidate to Cuomo’s right as the Republican nominee, did not escape Cuomo’s scathing critiques either. “The Republicans in this state put on the top of their ticket a Trump mini-me. He's anti-woman, anti-LGBTQ, anti-gun safety, anti-immigration, anti-education equity, and pro-Trump's New York tax increase. All he is is a banner carrier for the extreme conservative movement,” Cuomo said, incorrectly characterizing some stances by Molinaro, who has opposed the federal tax reform and has said he did not vote for Trump for president. But Cuomo did name Molinaro or Nixon, whose campaign sent out “fact check” emails as the governor spoke, contrasting his rhetoric with his record as they framed it. Notably, Cuomo pledged in his speech to “start a new movement of education funding equity” to ensure that public schools receive the resources they need to provide a sound education to all students. It’s a cause that Nixon has championed for nearly 20 years, largely placing blame for insufficient education funding on the governor, who has repeatedly shifted the way he talks about education funding. For Democratic State Committee members, Cuomo had successfully grasped the title of progressive. Several members, enthused about a strong and diverse statewide ticket, seemed almost offended that anyone would challenge their champion. “I think we put together a great ticket, I like the diversity of it,” said Crystal Peoples-Stokes, who holds the dual role of state Assemblymember and Democratic State committee member from Assembly District 141. “I think it’s important that the ticket looks more like the electorate,” she said, in apparent reference to the fact that James is an African-American woman, whom Cuomo has backed for the attorney general position, as well as Hochul’s presence on the ticket. “I do take some exception to people always questioning what has happened when most of the progressive things we’ve done in the state have not been done in the rest of the country,” she added. As with others, Goldstein expressed reservations about Nixon’s candidacy. “She’s a good actress. I compare her as being our quote-unquote Trump, as far as no government experience, she really does not know how to politically get things done,” he said. In announcing a unification deal between two Democratic factions in the state Senate on Wednesday, Cuomo said the Democrats would be able to regain a majority in the chamber if they win two state seats in special elections set for April 24 and if a renegade Democratic senator who caucuses with Republicans rejoins the fold as well. Just hours later, however, Cuomo signed off on an email blast from the State Democratic Party to its base that dubiously claimed that just one special election victory could swing control of the Senate. At a news conference on Wednesday afternoon at the governor’s office in Midtown Manhattan, Cuomo and Democratic leaders from the state Senate announced that the Independent Democratic Conference, a breakaway group of eight Democratic Senators who align with Republicans to control the chamber, would rejoin the mainline Democratic conference. Senator Andrea Stewart-Cousins, the Democratic minority leader, will lead the unified Democrats, with IDC leader Senator Jeff Klein serving as her deputy. As of today, that would give the Democratic conference 29 seats, while Republicans hold 31 in the 63-member body, though they get to a one-seat majority with Senator Simcha Felder, a nominal Democrat who is fully part of the Republican conference. The Democrats are hoping for victories in special elections for two vacant state Senate seats on April 24, bringing them to 31 and a chance to woo Felder to their side or add to their ranks through this fall’s elections, wherein all the seats in the Senate and Assembly will be on the ballot. “Majority Leader Andrea Stewart-Cousins has a nice ring to it, don't you think?” read the Wednesday email, signed by Cuomo, from the State Democratic Party. It was an effort to recruit volunteers to phonebank for Shelley Mayer, who is running for one of the vacant Senate seats, in Westchester, and whose victory is crucial for Democrats’ chances at a majority. The second vacant seat is in the Bronx, where the Democrats are all but guaranteed a win. It’s true that if Mayer wins (along with Assemblymember Luis Sepulveda, who is running for the Bronx Senate seat), there will be 32 elected “Democrats” in the state Senate. But there’s no guarantee that that will give the Democratic conference control of the chamber because of Simcha Felder, who represents part of Brooklyn, where he was reelected in 2016 appearing on multiple ballot lines, including Republican, and has been elusive about his future allegiances. Despite the language in the email, Cuomo himself acknowledged that reality at the news conference earlier on Wednesday. “Our work is not done today. We have the special elections I mentioned on April 24th. We also have a Democratic Senator who is still a question mark, let’s say, and we would have to convince him to come back to the Democratic conference,” Cuomo told reporters, referring to Felder. Cuomo had previously listed off top progressive policy priorities that he said Senate Republicans refused to pass, such as abortion protections, additional gun control measures, campaign finance reform, early voting, and more. State Democratic Party Executive Director Geoff Berman did not respond to a request for comment for this article. Berman, who was hired by Cuomo, frequently signs e-blasts from his group, though Cuomo has signed nearly half a dozen in recent weeks, which some have tied to the recently-announced primary challenge against the governor from Cynthia Nixon. Berman, the State Democratic Party, and Mayer have also made repeated fundraising and organizing pitches on social media, calling on people to elect Democrats’ “32nd State Senator” to flip the Senate and to donate $32 for the 32nd seat. Felder is a conservative who represents a Brooklyn district with a large Orthodox Jewish population, and he has leveraged his position in the Senate to pass policies and budget items that have been favorable to his district. In his most recent act of opportunism, he held up the passage of the state budget until legislative leaders agreed to relax oversight of yeshivas, the private Jewish religious schools. He has previously indicated he will conference with whichever group can offer him the most for his district. Felder’s office did not respond to an email requesting comment for this story. 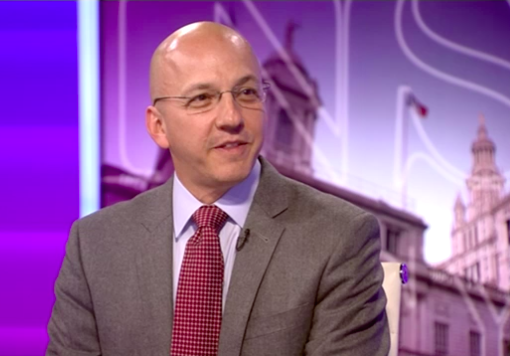 In an interview last week on NY1’s Inside City Hall, Geoff Berman, the executive director of the New York State Democratic Party, suggested that a contested primary would be counter-productive for the party. “[M]y mission is to elect Democrats to office, so my focus in this important election year is on maintaining the Democratic seats that we do have, and increasing them by flipping red seats to blue,” Berman said, when asked by host Errol Louis about the apparent conflict between centrist Democrats who control the party and more left-leaning party members. Berman emphasized that the party’s priorities are to elect New York Democrats to the U.S. House of Representatives and to the State Senate, both legislative bodies under GOP control. Naturally, that didn’t sit well with those tired of Cuomo and his unfulfilled promises on various progressive causes, including to help flip the state Senate, and who are hoping to see a competitive primary battle between the two-term incumbent and Nixon, the insurgent. “Theres a primary, state party shouldnt take sides,” Teachout tweeted [sic] on Tuesday, a day ahead of Berman’s appearance on NY1. Teachout then had sharp words for Berman’s comments during the interview, all continuing a line of criticism she and others have been leveling as the state party has recently increased its activity, often in support of or in conjunction with Cuomo. Berman has continued to maintain that the state party has no obligation, at least under its own bylaws, to remain neutral in the primary, though it would conduct a fair nominating process at the party’s convention in late May. The party-backed nominee is chosen through a weighted vote of more than 300 Party Committee members representing Assembly districts, with the weight depending on the number of voters from each district that voted on the Democratic line in the previous gubernatorial election. A candidate who is not the endorsed nominee can also petition to get on the ballot if they collect enough signatures. When Teachout said the party should take no sides in the primary, Berman responded on social media, “Wrong actually. There is no neutrality rule and customarily parties support their incumbents. And: Who is “the party?” The voters who decide our nominee on Election Day? Members of the party committee like @ZephyrTeachout (non-neutral) who vote to endorse a candidate at our mtg?” As he noted, Teachout is indeed an elected member of the state party and will have a vote on the party’s eventual endorsement. For a progressive activist base that has been hitting the streets since the 2016 presidential election, Berman’s recent comments are simply confirmation of their long-running criticisms of the governor and his stranglehold on the state’s Democratic machinery. “It seems like @geoffberman doesn't take seriously his job as @nydems exec director, which obligates him to strict neutrality in primary contests. He thinks he's @NYGovCuomo's PAC director,” tweeted activist Peter Feld. “@geoffberman is signed sealed and delivered apparently,” tweeted NY Indivisible, a group dedicated to electing Democrats. “This sums up everything that is wrong with the Democratic Party and its corporate sycophants,” wrote another Twitter user, Robert Margolist. Even before Berman seemed to declare that the state party would rally behind Cuomo, questions were raised about the party acting as an extension of the Cuomo campaign. There was an expensive ad blitz launched last month by the state party touting the 2013 passage of the SAFE Act, the governor’s signature gun control bill. Though Berman claimed that the ad campaign was intended to target Republicans running for reelection in the state, critics, including Teachout, said it seemed intended more as a boost to Cuomo just a week after news reports that Nixon was about to jump into the race. Also, between March 7 and 27, Cuomo signed his name to at least six email blasts from the State Democratic Party on topics including gun control and the NRA, sexual assault and the #MeToo movement, and early voting. When New York Times reporter Shane Goldmacher pointed that out on Twitter, Teachout posed the question, “Executive Director @geoffberman, do we have your word that you are not consulting Cuomo's reelection campaign when deciding what emails to send?” The tweet prompted portions of the ongoing debate about coordination and neutrality. Notably, both the State Democratic Party and Cuomo’s campaign have retained the services of Metropolitan Public Strategies, a prominent Democratic consulting firm. Nixon already faces a massive uphill battle, competing against an incumbent with $30 million in his campaign coffers, far greater name recognition, and strong support from labor unions. Yet, many Democratic elected officials have been hesitant to endorse Cuomo in the early going of the campaign and it is yet to be seen how much grassroots support for Nixon emerges among Democrats.